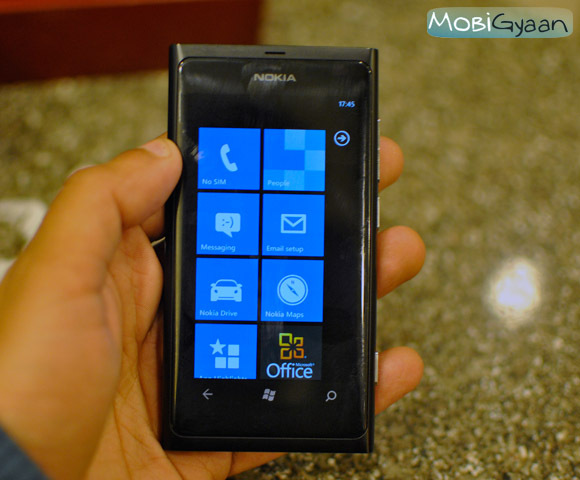 We wrote a review of the Nokia Lumia sometime back. We also reported that it had battery bugs. Well, the handset that we got had a major bug. It used to switch off and take ages to switch back on. That was a major turn off for this attractive but expensive device. Well, now we are back with a piece on the update – where you can find it, how do it and finally, what happens after that. We give you everything you need regarding this update. Well, according to us. How to go about it: What you need to do is have a syncing application on-board. This could be a Windows Connector for Mac or the Zune PC application on a Windows PC. Once you have done this. You will see two Buttons in front of you, on the Zune PC application menu – app marketplace and device options. Click on the device Applications button and a drop down menu will open. At the bottom of this menu there is a check for update button. Besides that there is a Create backup button. We would advise you to create a backup of your content before you update it by clicking on the button. The whole process takes about 10-20 mins. After that click on the check for update button. The application will find an update and ask for your permission. Click on yes, and it explain how your handset needs to be updated and what the update is al about. Read it f you want and agree. Now just sit back and wait. The handset will be updated. In the process it will also witch on and off more than once. Do not disconnect. How to check if your handset is updated: Well just click on the check for updates button in the menu. If it shows you that Operating system version is 7.10.8107.79 and shows no that updates, your handset is up-to-date. Enjoy! A review of the update: Well, the battery problem is solved. Add to that, Wi-Fi access is better now. The TimesPoynt application also works better now. There are some additional updates expected soon such as a second batter update, camera and audio bug fixes. Keep your ears glued to us.